1. Preheat the oven to 180°C. Line cookie tray with baking paper. In a medium bowl, mix 1 tablespoon of flax seed powder and 3 tablespoon of water and give it a good whisk. Set aside for 10 minutes allowing the flax seed to absorb water. 2. In a microwave safe bowl or a double boiler, melt the chocolate and butter together. Then whisk them until smooth and stir in the cocoa powder. 3. Now add curd and brown sugar to the flax seed mixture. Whisk until fluffy. Beat in the vanilla extract, salt and baking soda. Now beat in the melted chocolate mixture. 4. Gently fold in oats, whole wheat flour and chocolate chips. Allow to stand for 5 minutes so that oats can absorb moisture. You can add extra teaspoon or two of oats, if the dough feels a little ‘loose’. 5. Using a cookie scoop or just pull a lump from the dough and drop on a tray, shaping as you go, placing them an inch apart. 6. 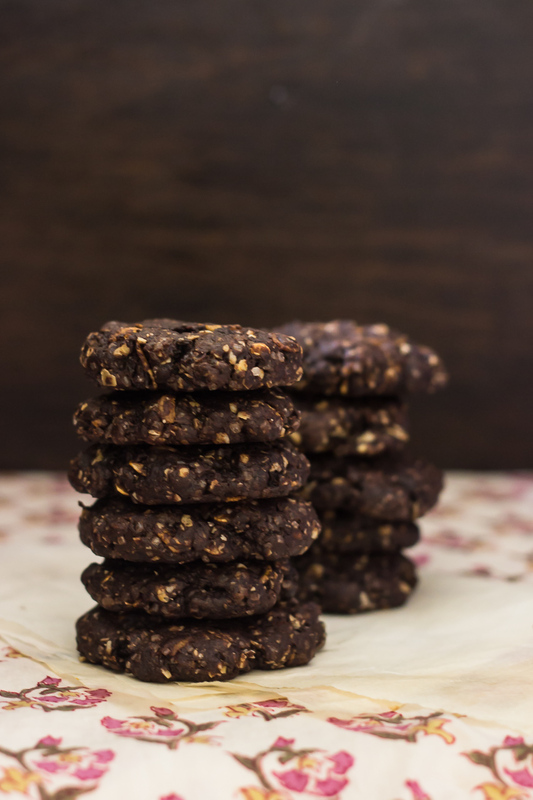 Bake for 15-20 minutes until the top feels set for a soft fudgy cookie, and extra 5 minutes for a firmer cookie. I recommend a soft fudgy cookie than a firmer one. 7. Leave to cool on tray for 5-10 minutes, then transfer to cooling rack to cool completely. You can store them in refrigerator in an air tight box. Use double cookie trays for baking chocolate chip cookies, and the lower element only in the oven.